With an aluminum fence, you can achieve the look of a traditional wrought-iron picket fence, railing and gates and stay within your budget. Aluminum is durable, lightweight, low-maintenance and will last for years to give your property a distinguished look. Ornamental aluminum fencing is designed to reflect ornamental iron fencing that has been popular for hundreds of years. We offer various products for those looking to enhance and secure their property, and we’re happy to provide numerous styles and designs to fit your needs. If you’re looking for a fence that’s going to stand out and be different from your neighbors, then you’ve come to the right place. 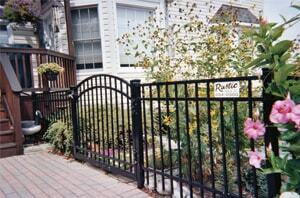 Rustic Fence, Inc.’s aluminum fencing can be customized to fit your personal taste. We’re able to provide virtually any style of ornamental fence needed for both residential and commercial needs. Please feel free to look at our ornamental fence gallery and for a free quote. Why Choose Rustic Fence, Inc.? We’ve been building residential and commercial ornamental aluminum fences for decades and our experience is accompanied by expert knowledge and a craftsmanship. We can craft a truly unique enclosure that compliments your property and personal taste. You’ll speak with the owners directly — no pushy salespeople or middlemen! Please review our ornamental aluminum photo gallery and contact us today for a free quote. Rustic Fence, Inc. provides commercial and residential fence and installation services throughout Maryland, including Rockville, Gaithersburg, Olney, Westminster, Ellicott City, Frederick, Glenelg, Glenwood, Clarksville and many more communities has provided residential and commercial fence and installation services for over 40 years and services clients throughout the Maryland counties of Howard, Montgomery, Frederick, Carroll and Baltimore. Along with ornamental aluminum fencing, we carry and install most any type of fence including privacy, stockade, gates and specialty fencing and much more. Be sure to visit our ornamental aluminum fencing photo gallery to see our work and call us today for a free estimate! 301-854-6500.